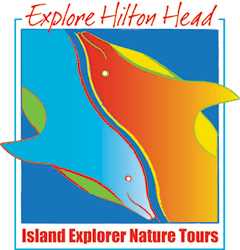 Hilton Head Island offers more family entertainment than just about any resort in the Southeast. On just about any night your family can enjoy great show at minimal or no cost. 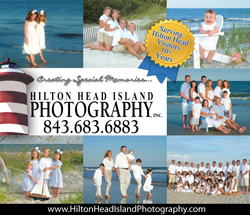 All of the shows listed have long histories on Hilton Head and have entertained entire generations of kids. Families that enjoy live music and like to see their kids involved with the show should make it a point to see every show listed. You'll have a fun and entertaining evening and and a great family experience - from the youngest kid to the grandparents. Performing nighly except Saturdays from Memorial Day through Labor Day, Gregg Russell is an institution at Harbour Town in Sea Pines. 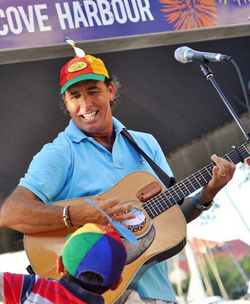 With over 30 continuous years of offering family entertainment, Gregg is as much a comedian as a singer, weaving stories, songs, and heartwarming and hilarious interviews with kids from his audience. Gregg's music tends toward folk and standards, with a sprinkling of quality orginal material. Having written and produced songs for PBS and several movies, Gregg brings a leval of professionalism to his stage that one might expect to find on the most prominent stages in a America. Plan on arriving early to get a seat. Parking in Harbour Town is limited. Take the Sea Pines Trolley if you are coming from outside Sea Pines. Gate Fee for outsiders: $5.00 per car. A native of the Lowcountry, Shannon Tanner has been singing around Hilton Head Island for years and years. Performing Monday through Friday at Shelter Cove Harbour, Shannon offers both family shows and adult shows each evening with the family show at 6:30 and 8:00 PM. A year round professional singer, Shannon performs a broad mixture of popular music, country, folk, standards, and great kid's songs. There's lots of audience interaction, and the little ones love to join Shannon on the steps of the scenic gazebo stage overlooking to waters of the harbor. Adults will enjoy this show as much as the kids. Shannon's excellent acoustic guitar skills combine with a powerful voice remeniscent of James Taylor or David Wilcox to produce a mesmerizing sound without the need for backing tracks or additional musicians. Every family should enjoy this show. On Tuesday nights through the middle of the summer, Shelter Cove Harbour busrts alive with a Fireworks show at 9:00 PM. Known as "HarbourFest" this event brings a festival atmosphere to the entire marina. Come early as parking is a premium, especially on Tuesday nights. On Thursday night Shannon presents "Parrot Palooza" performing the songs of Jimmy Buffett and similar artists with a full band. While it is a family-friendly show, it is not interactive for kids.